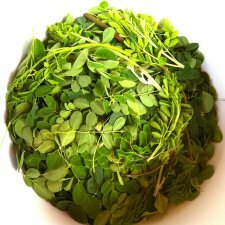 Moringa: the most nutritious plant known to man! 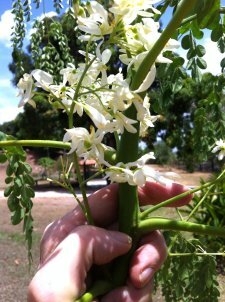 Moringa’s flowers, leaves, fruits, and stems can all be used. Here at Finca La Maya, Moringa is organically grown, selected by individual leaf quality, low-temperature dried, and entirely hand processed. Moringa’s properties can maximize wellness for anyone. 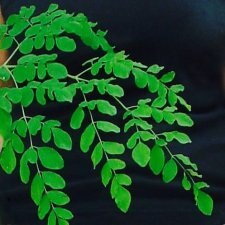 If taken on a regular basis Moringa can: enhance mental clarity, detox the body, strengthen your immune system, fight cancerous cells, slow the aging process, support weight loss, minimize inflammation, improve overall physical strength, enhance sexual desire and performance as well as many others. 4 TIMES MORE VITAMIN A THAN CARROTS..
For decades Moringa has helped solve widespread starvation and malnutrition in marginalized areas. Around the world, Moringa serves many different purposes. It is used as fertilizer, dye, rope-making, plant disease prevention, as well as use of the trees as ornaments and many others. When taken on a regular basis, Moringa can fight cancerous cells and alleviate diabetes. When taken regularly, Moringa can normalize and regulate cholesterol levels as well as help stabilize normal blood sugar levels. It can help maintain healthy heart function and improve blood circulation. 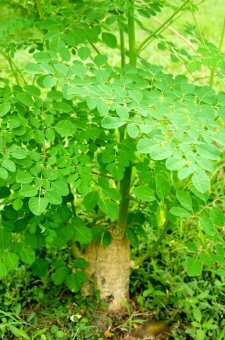 When taken in reguar doses, Moringa can improve mental clarity, fight depression and stress, alleviate hormonal imbalances, as well as improve immunity and sleep quality. My grandfather had been inflicted with brain damage from a car accident and could not walk, eat, or speak. By the third and fourth weeks of Moringa, we noticed such improvement that we could almost not believe it: my grandfather was swallowing both fluids and solids completely normally, his speech was absolutely clear, had regained 25 of the lost 35 pounds. But what impressed me the most was when he stood from his chair all by himself and decide to walk to my aunt’s house (about 200 meters), and so he did. What I am experiencing with Moringa is a remarkable feeling of well-being. I wake up alert in the morning. I have not changed my diet or anything else except for the addition of Moringa. I was looping in and out of depression, unable to leave bed. I had lost interest in things, had no hobbies and wasn’t eating. I felt blah, After taking moringa for one month, I feel emotionally stable and strong.